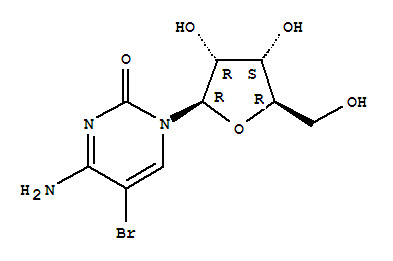 The Cytidine, 5-bromo-(7CI,8CI,9CI) is an organic compound with the formula C9H12BrN3O5. With the CAS registry number 3066-86-2, its systematic name is 5-bromocytidine. Physical properties of Cytidine, 5-bromo-(7CI,8CI,9CI): (1)ACD/LogP: -0.95; (2)# of Rule of 5 Violations: 1; (3)#H bond acceptors: 8; (4)#H bond donors: 5; (5)#Freely Rotating Bonds: 5; (6)Index of Refraction: 1.799; (7)Molar Refractivity: 60.2 cm3; (8)Molar Volume: 141.011 cm3; (9)Surface Tension: 93.663 dyne/cm; (10)Density: 2.284 g/cm3; (11)Flash Point: 289.701 °C; (12)Enthalpy of Vaporization: 96.16 kJ/mol; (13)Boiling Point: 555.408 °C at 760 mmHg; (14)Vapour Pressure: 0 mmHg at 25°C.